The University of Delhi is home to a lot of talent and uniqueness.We bring you a series of unconventional college societies that put their heart and soul into their respective fields. Image Credits: Surabhi Khare for DU Beat. Peace in itself is a wide emotion with no limits. Life of a student can be really hectic sometimes. Being a student, one has to strike a balance between studies and other activities, which can be stressful. So, the peace society stands for spreading peace and harmony within everybody and outside all around in the environment. The society conducts various activities for the overall development of the members. The society has yoga and meditation sessions as well. The society believes being at peace makes a person more productive.For this, talk sessions and seminars are organised. The members also get to learn how to remain calm and poised in every situation. Puzzle is a world where no one can ever get to know everything, but only by constant activeness and willingness to know more one can cross half a mile.A person should have strong analytical and logical skills to be a member of this society. One should be able to identify all the tricks of any puzzle with reason and logic . The society believes that the members are like the puzzle pieces that stick together by their contribution towards the society to make it work as a whole. Image Credits: Saubhaya Saxena for DU Beat. 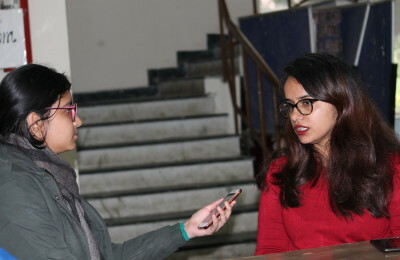 Vision, the newspaper society of Hansraj College started out as a secret society, aiming to connect every aspect of Hansraj with its students. In recent years, the society members have had more opportunities and practice to work, act and edit. This year’s college elections were actively covered by vision members. The society wants to encourage any hidden talent that might be stirring, which is why all members are expected to write and report regularly. The society believes in encouraging the members to see themselves as journalists whenever they report. Building future journalists is one of the goals of the society. Vision constitutes four teams-editorial, technical, sponsorship, and photography. Some of the members have been interning or have interned at a number of places, one of them being the Hindustan Times. Image Credits: Saubhagya Saxena for DU Beat. Hindu College has had one of the largest lawns in North Campus and it also boasts of a large population of dogs, amphibians, and birds. Initiated by the Zoology Department, the society started striving to understand and preserve all these creatures with a couple of conservation strategies. The society is also participating in a project with World Wildlife Foundation. Feature Image Credits: Surabhi Khare for DU Beat. Previous PostCampus Placement Drive 2019: LSR Graduate Bags a Whopping 38 Lakh Package Next PostWhy is the Citizenship Amendment Bill Evoking Protests in NE?